Iceland - Who's behind the 'Icewall'? Well, we are - the residents and community of Hornsey Park Road. This monstrous and ill conceived development far exceeds and drives a coach and horses through current planning policy. 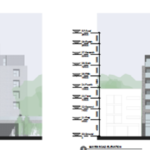 Its nine storeys will overlook and dominate two storey Victorian houses and back gardens. Its lack of garden and amenity space will see its occupiers having no outdoor space in an area of intensification already an 'area of open space deficiency'. Developers have sought to please Haringey with a bizarre raised 'podium' deck overlooking our homes to give occupiers somewhere. This greedy development offers none of the promised high quality public realm, instead taking away the valuable open space on the corner of Brook Road. Inexplicably, the developer and land owner think it acceptable to ignore policies on protecting and enhancing London's Blue Ribbons, the network of linear open space above our rivers: in fact the policy in Haringey and the Mayor for London is to open up our rivers, reintroducing nature and giving to the community access to perhaps our most valuable asset - the Moselle Brook. So who is really behind the Icewall and why does development intended to kick start the regeneration of Wood Green have to look like this? Well, the answer may surprise you. Haringey Council is the landowner. Haringey planning and regeneration officers appear to have encouraged the developer to build higher and more densely than planning policy permits. Haringey cronies, in the form of a 'design panel' of so called 'experts' have opined that this development is 'good' yet they never bothered to consider its impact on the homes and gardens it would overlook or the importance of protecting and opening up the 'Blue Ribbon' in an area of open space deficiency. Some effort has been made by Haringey to say development at this price is a priority because it will now contain a health centre, when there is already planning permission for a new health centre in the Heartlands. In this, they are acting both on behalf of the CCG, with whom they share offices, but also themselves, but it seems that the CCG, who have gone strangely quiet on the need for facilities now in this location and at this cost, may not actually have the support of their NHS bosses. It could all be a fiction - time will tell. Meanwhile, the loss of the Iceland store will be a loss in local employment. The new shops will create unnecessary competition with those in the High Road and shopping centre, putting further stress, if any were needed on Wood Green's retail heart. The planning application for the redevelopment of Iceland has been lodged and the public have, ungenerously been given the minimum period of 21 days, ending 10th November, 2017 to make their voice heard. STOP THE ICEWALL - PMRA will be using this website to detail our community's objections and publish a template letter which residents can use to submit individual objections. In our view, it is a premature, contentious development where Haringey holds conflicting interests: Haringey is the landowner, strategic planning authority endeavoring to push ahead with its AAP plans in advance of due process and authority in charge of Development Control. It hosts the CCG and been the applicant to NHS England for funding on the basis that it already had a home for a health centre (when clearly it did not). It would almost certainly like the CCG out of its building in Station Road so it can redevelop that site as part of its plans for the HDV. It will see the development value of the Iceland site jump in consideration of the lease paid for by NHS money as well as added value form the pharmacy that will almost certainly follow, were planning permission to be granted. It seems be to asking the public rather a lot to trust the councillors involved in planning matters to represent the interests of the whole community and maintain an open mind when considering this planning application when Haringey is so deeply involved in the development and so committed to seeing it go forwards.